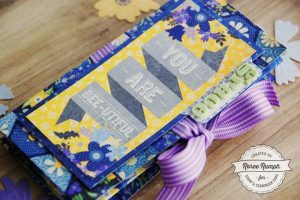 I hope all of you have started your new year off with some fun cardmaking! Did you promise yourself that you would send a card to someone special every month? 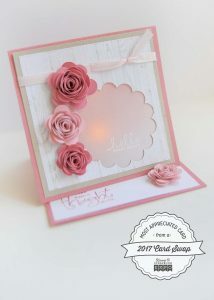 Maybe you are going to introduce cardmaking to one of your friends so you both can enjoy making cards together. In any case, 2018 is going to be a great year at the show for the Card Swaps. 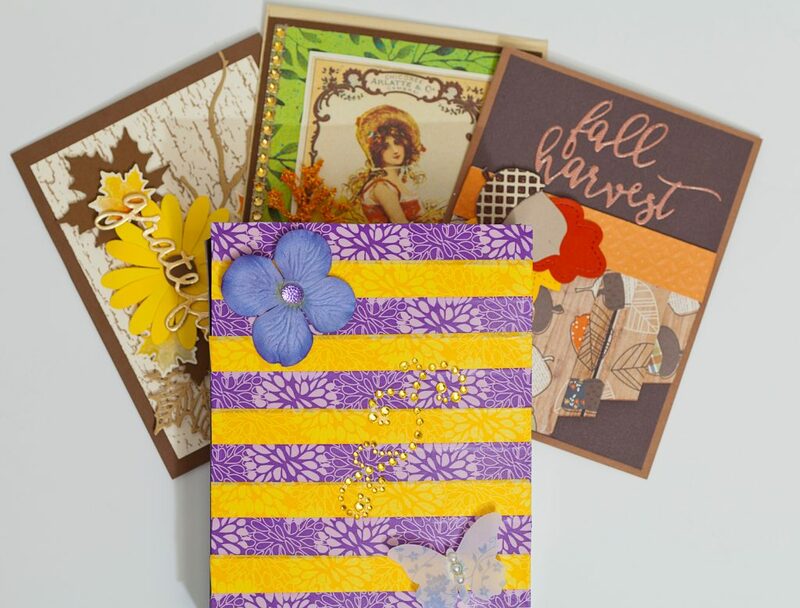 We have some great Card Swap sponsors this year, including Queen & Co., Darice, Krazy Kreations, and Craft Fancy. Mark your calendars now so you do not miss any of the Card Swaps at a show near you. 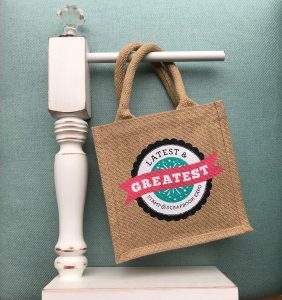 Click here www.scrapbookexpo.com to view our 2018 schedule of shows and plan your creative getaway! At the start of the new year we all want to be the best we can be. 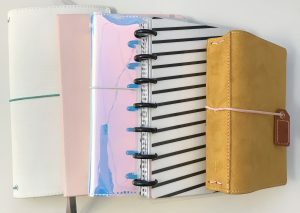 Finding a new organizational tool is a fun way to start. Here is a fun way to use the packaging that a food item comes in and turn it into a great way to transport your cards in a safe manner. Most of you may have heard of a brand of nutrition bars called “Kind Bars.” Once you have enjoyed them, you can turn the box that those bars come in into a cute, simple, and personalized way to carry your cards. With the sample below I have used some washi tape (I know you may have a few rolls laying around) to simply cover the outside of the box. Place your A2 cards in the box and now you have a safe way to travel with those cards so they stay crisp and you don’t have to worry about them getting smashed or bent. 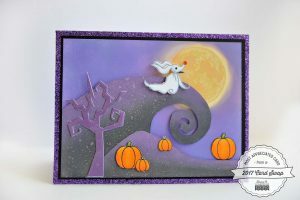 This idea came from one of our Card Swap guests in Akron, OH last year. 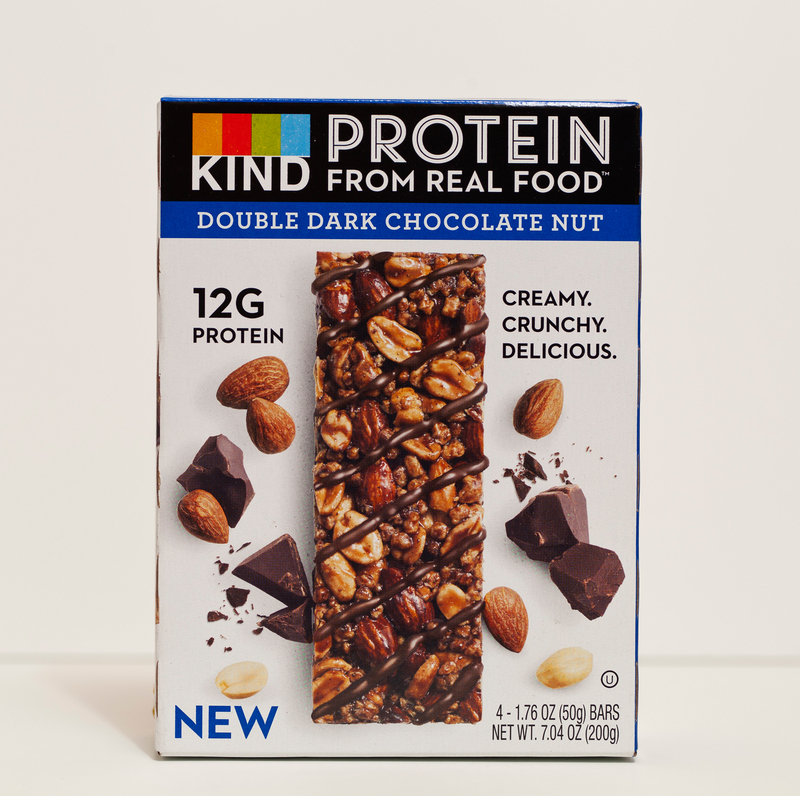 I thought this is a great way to have a snack and not feel guilty about it! There are so many other ways you could decorate the box with paper, embellishments, and much more. The lovely cards shown were provided by Debbie S., Toni G., and Irene Segal from our Ontario show. 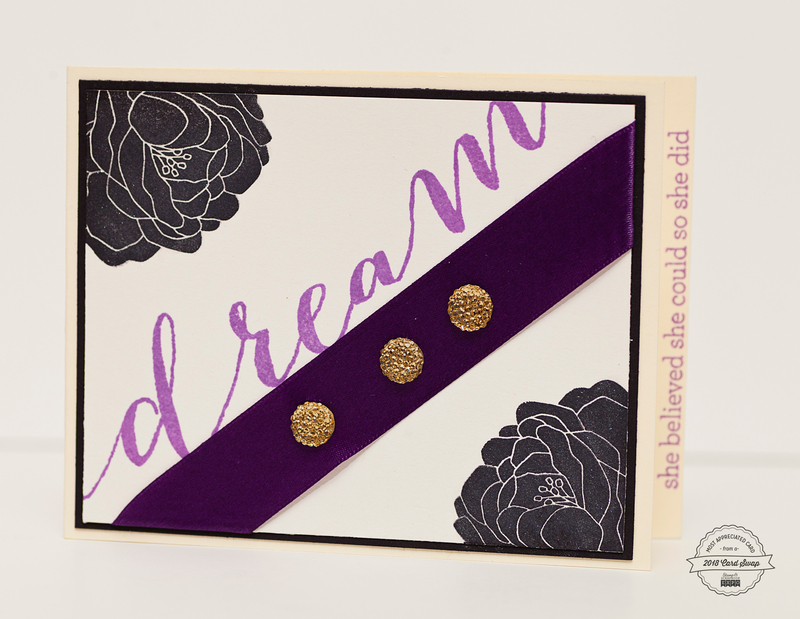 Here is another card from our show in Akron, Ohio and this lovely card, created by Wendy Easler, reminds us to dream. Everyone needs a card like this to help you hold onto your dreams. The sentiment on the side says it all – “She Believed She Could So She Did.” Maybe the three bling embellishments signify three wishes you get to dream about. Or maybe it represents three dreams that you have accomplished. Whatever the meaning, keep those dreams alive in your heart and share a dream with someone else. Thank you, Wendy, for sharing your card with us! The Sacramento show card swap brings us this card created by Ashley Denzi. The flowers were all handmade and created by Ashley. At the base of the card you can see where she used one of her flower creations as a holder so the card stands up to show the wonderful sentiment and beauty of the flowers. 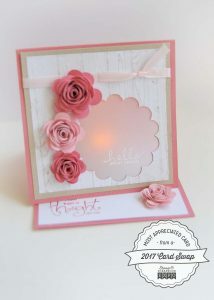 This card even included a small flickering light to place in the card to give a beautiful light effect. Kimberly McField shared this sparkling card with handmade embellishments. 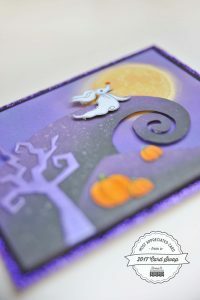 She said that she could not find any “Nightmare Before Christmas” embellishments so she made her own. 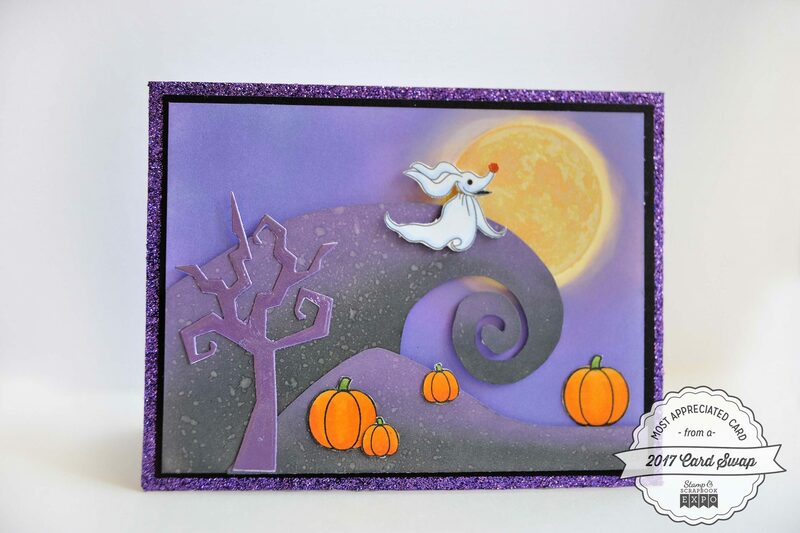 This card is layered with the shiny purple border, pumpkins, and a spook-filled tree. Layering always brings out the best in your cards. 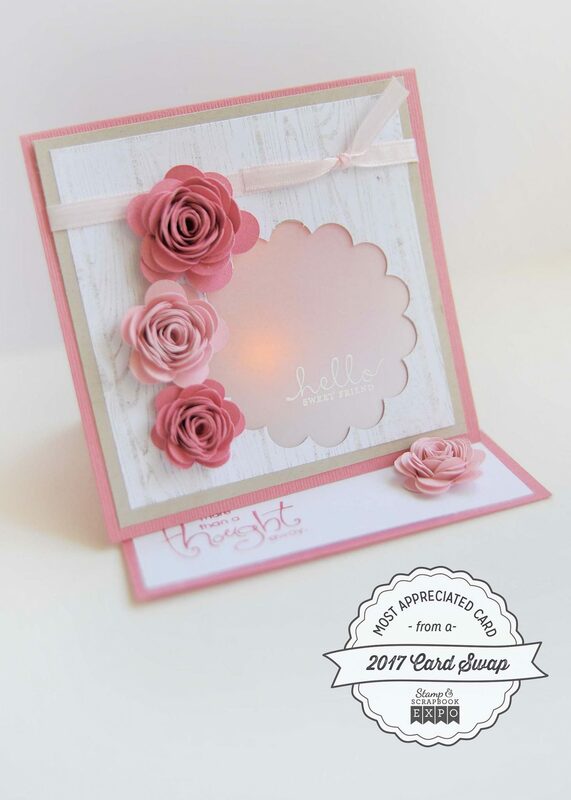 Cardmakers across the country, I wish you a very Happy New Year and challenge you to put a new year’s smile on someone’s face with a card. Make a few simple thank you cards and have them with you when you can. When you see someone who is working hard or does something nice for you, hand them one of your handmade thank you cards. You never know how much giving them a simple card that says thank you may mean to that person’s day. 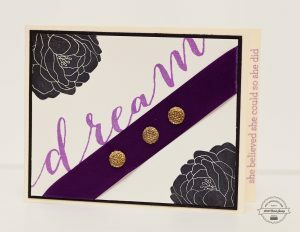 This entry was posted in Blog, Card Making, Card Swap and tagged Cardmaking, Floral embellishment, organization, Stamping. So much fun to everyone’s creativity!